I've been having a look at the stamp sets on the Last Chance List this week and the set I'm using today is very close to my heart - Seeing Spots. It was the first ever set that I bought at my first ever Stampin' Up party! That was couple of years ago - a friend invited me to her party and, although it really didn't sound like my kind of thing at all, I went along to be sociable. Well, what can I say? A couple of years later here I am, a Stampin' Up demonstrator, enjoying a creative life making cards and other crafting projects every day, helping others to be creative too and loving every minute of it! If you were thinking of signing up to be a demonstrator too, I cannot recommend it highly enough. Some people sign to get the discount on their Stampin' Up supplies and others are keen to build a successful business. I'd love for you to join my team whatever your reason, and would offer as much support as you want. If you're interested, give me a call on 01280 820593 or click here to drop me an email and we'll have a no-pressure chat. Anyway, I digress! Here's a card I made to add to my much-raided stash of thank you cards. Cut a piece of Ballet Blue card stock 5.5cm x 11.5cm. Stamp a design on the bottom and right using the flower stamp and versamark ink. Tie a piece of silver elastic thread round it several times and tie in a bow. Stamp the encircled flower image onto a scrap of Whisper White card stock using Ballet Blue ink. Cut it out using a 1 1/4" circle punch, pierce the centre and add a Pumpkin Pie brad. Mount the flower onto a metal edge tag. Using the Boho Blossoms punch and scraps of coloured card stock, cut out three flowers and decorate them with coloured and silver brads. Arrange the embellishments onto the blue panel and attach them. Mount the blue panel onto a piece of dp cut to 6cm x 12cm, then onto a coordinating piece cut to 8cm x 13.5cm. Mount this onto a Close to Cocoa card blank and finish with a sentiment. Now come and have a little wander down memory lane with me! This was when I discovered that I could make seed-head type flowers with this set! 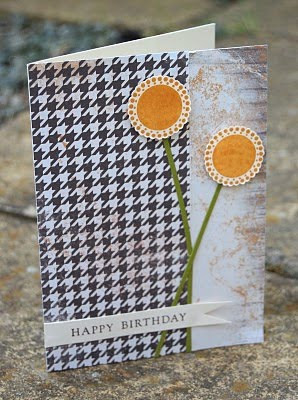 And this was a coordinating set we made at one of my card classes. Look how beautifully the sentiment from the set punches out with the 1 1/4" punch and nests perfectly in the scallop circle punch to make a tag. ... and these were made for my twelve year old son to write thank you messages after his birthday. I thoroughly enjoyed making all of these cards and I really don't think I want to part with this set! It's on the Last Chance List at a hefty 25% discount and at only £10.46 for a set of six stamps how can you do without it?! Those metal edged tags are fun too - and only 2.95 per pack! Thanks for popping in to visit me today. Do leave me a comment if you'd like to - I love to hear what you think. And if you have a moment tomorrow, come and join me for Three Minute Thursday! I really like that when you get a stamp set you use every image in it in many different ways. These are all great projects and I really like the flowers on the houndstooth print but I have to say my fave is the thank you note cards. The simplicity and white space with the graphic design of the elements is so visually appealing.